There’s a wide selection of weight benches on the market and finding the right one to suit your needs can be a headache. Like most people when buying a new piece of gym equipment your first restriction might be the price? If you are looking for a solid bench for under $100 the Universal bench comes with a lot. 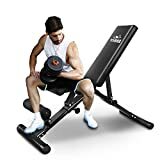 Universal’s weight bench is perfect for home use, best suited for beginners and the intermediate, although I’m sure even an advanced bodybuilder would get some valuable dumbbell use out of it. It has just the right thickness of padding, not too hard that it distracts you, but not too soft either, just right! The back support has been contoured which will allow more freedom for your upper body to move through the exercises. With a 430-pound maximum user and lift load, the bench should cater for some heavy lifting. A great bench if you are just starting out, you should easily get a few years use before you grow out of it. Another feature worth a mention are the foam rollers on the front. Specifically designed to keep your feet in a fixed position when the bench is set to incline, they are easily removed if you so wish. 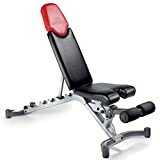 Universal has a well-known reputation for making quality home gym equipment and this bench is no exception. Universal ship the weight bench with a two-year frame warranty and 30-day upholstery. The most important aspect is the height of the bench, some cheaper benches are too high and light and you end up with a wobble when you are training, this is a big no, especially when you start to lift the heavier weights you could cause yourself a bad injury. Universal’s bench has a nice low profile design giving it stability. Wouldn’t it be nice if everything came preassembled? But sadly this bench doesn’t! Whilst it’s not going to take you all day to build ( most people who bought this bench found it relatively easy) it certainly won’t be as difficult as some of the flat packed furniture I’ve tried to put together in the past…What a nightmare some of those can be. This bench will take 30-40 mins max for construction and you need a few tools to fix it together. Solid is a good word for this bench, actually its a good word for any weight bench. One guy’s review said it felt like he was sitting on a tank…slight exaggeration maybe but because of the design of this bench it is sturdy and solid and that’s surprising for such a light bench.The bench weighs in at 33lbs so you can move it around quite easily. Especially handy if you are challenged for space and need to pack it away after use. Bare in mind the Universal bench will not completely fold flat and does not have wheels, but because it’s light it shouldn’t pose too many problems when moving it. If you buy a flat bench it has its own limitations, but an adjustable bench such as Universal’s: has 5 positions (-10, 0, 15, 30, and 45 degrees), allowing for a wide range of exercises for the upper body. The biggest let down for me with this bench, is that it lacks the 90 degrees option for shoulder press.I see no reason why they decided not to put a 90-degree notch in there, it’s a shame really but for $75 you can’t moan. 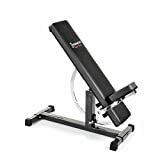 Sadly barbell bench presses are out with this bench unless you have a power rack, but whilst I wouldn’t suggest any barbell bench presses with the bench, there’s an absolute ton of exercises you can do to get the most out of the bench. .
Summary An Uncomplicated, well made, well-priced weight bench for the beginner. 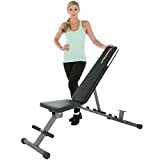 If you are looking for a durable bench on a budget, the universal 5 position weight bench will provide you with the stability and versatility you will need for your home workouts. Hi Olly, I’m glad you found the review useful. Thanks for dropping by.